Spin-offs are usually made to bank on the success of a major production, where there are characters that the audience are dying to know more about. Successes are far and in between and perhaps with the exception of The Scorpion King, spinning off the Mummy series, there haven’t been much successes when in comes to spin-offs. 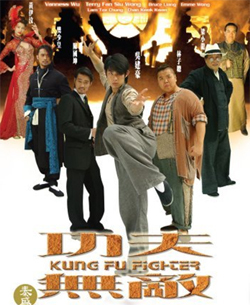 Likewise, Kung Fu Fighter is an obvious spin-off from the ultra successful – Stephen Chow’s Kung Fu Hustle, with a majority of its supporting cast showing up in the aforementioned flick. A film without Stephen Chow can never be compensated by its hero’s sidekicks. Kung Fu Fighter attempts to mimic the predecessor jokes, action, comedy and spices of romance, but fails miserably in its attempt. It is a fail attempt to re-create a classical atmosphere and the film suffers from cheap CGI effects, cheap laughs and some highly questionable action choreography. However, the main reason why it ultimately fails to deliver is simply the obvious, the lack of the master itself – Stephen Chow. The movie goes like this: Ma (Vanness Wu) is a young man searching for his kung fu expert father in 1930s Shanghai. Inheriting his father's super strength, he secures a job at a martial arts house and befriends Fat (Lam Chi Chung). The two fall into a trap and the Shanghai triads want to hunt them down. Meanwhile, Ma also has a crush on singer Lung (Emme Wong), but will the love between them blossom? With so many different parties plotting against each other, will Ma survive all the conspiracies? Sometimes when movies are made with the sole purpose of cashing in the success of some current craze may well be justified, but when the spin-off comes a good 3 years after the predecessor, nothing can be justified. F4 member Vanness Wu is no Stephen Chow and certainly does not have the right credentials to lead a movie. While Wu showed some bright spots in Star Runner back in 2003, his acting is limited and his fighting presence looks as though he is a runner from Africa. Some of the fight scenes, Wu seems to be dancing rather than fighting and being as skinny as Wu, he is neither convincing nor believable. However, the supporting cast of Kung Fu Hustle are always fun to watch and in particular, Bruce Leung, Lam Chi Chung and Chan Kwok Kwan are all pleasing additions. All three basically reprises their respective roles from Kung Fu Hustle and while the humour is by no means original, they are still the saving grace in an otherwise complete waste of time. Commenting on the female presence in this flick is almost to the point of lamenting. It is disappointing that this flick can not come up with someone prettier and fresher than Emme Wong. When you can’t act, a reasonable director would have cast someone who is fresh or at the very least, pretty enough to hold onto the audience mind and eyes. Unfortunately the director fails even in this department and the result is really appalling.